Fitbit Blaze review: does the Blaze set our world alight? Fitness tracking wearables are dominated by one company, Fitbit. So when that company decides to launch a new product range, it's kind of a big deal. The wearable was unveiled at CES in January, and it caused quite a commotion when the company's stocks plummeted after the announcement. Let's start with the cost, the Blaze is being sold by Fitbit for £169.99. That seems reasonable. It's competitively priced against the Apple Watch which still costs almost double that. But it's still more expensive than most of Fitbit's other offerings, which may put some people off. What do you get over Fitbit's previous models? A colour touchscreen for a start. This allows the watch to perform more advanced functions, such as true smartwatch notifications, and music control. In terms of fitness sensors, the Blaze has a three-axis accelerometer, optical heart rate monitor, and an altimeter. Crucially, though, no GPS, so this won't be a true marathon runner's companion. Instead built-in GPS is reserved for the range-topping Fitbit Surge (although the Blaze can make use of your phone's GPS when connected). The screen is one of the key features of the Fitbit Blaze, and thankfully, the company have delivered in this area. The 1.6-inch colour screen is bright, vivid, and sharp with a resolution of 240 x 180. It's easy to see in direct sunlight, and the touchscreen is responsive. It may not be as sharp or impressive at the Apple Watch, but our main issue with the screen is that it's too small, creating a large bezel around the screen which makes the watch look dated. Although, it must be said the small screen does not affect usability. It's worth noting that the screen is not always on, instead it has to be woken with a flick of the wrist or press of a button. It's fairly reliable when it comes to sensing this movement, but there have been several occasions when I've wanted to quickly glance at the time but failed to wake the screen. Next we'll move on to perhaps the most contentious point - design, after all, a wearable has to look good, doesn't it? The Blaze has our office divided, half love the way it looks, the other half aren't so sure. It's very obviously a smartwatch, but whereas the Apple Watch is smooth and rounded, the Fitbit Blaze is angular and edgy, giving it a retro look similar to a Casio digital. The Blaze comes in one size, but thanks to its relatively slender proportions, it'll look right at home on both male and female wrists. The watch actually consists of three parts, the strap, frame, and screen, all of which are interchangeable. Our review model featured a black elastomer strap, infamous for causing rashes on the Fitbit Force. Luckily we didn't experience any rashes, in fact, we found the Blaze very comfortable and lightweight, happily wearing it all the time, even while asleep. It does, however, feel quite cheap, with a rougher, more brittle texture compared to the (admittedly more expensive) Apple Watch Sport. The straps can be removed using a simple spring bar system, allowing you to swap it with others straps from Fitbit, including more premium leather and metal options. These additional straps start at £19.99and range up to £89.99. The modularity of the system is interesting, both the frame and straps can be changed, allowing for a flexible watch. Where the leather strap may not be suitable for gym use, you certainly wouldn't want to wear the elastomer strap to a dinner party, so you could switch between the two to suit the occasion. In terms of interacting with the device, there are three physical buttons located around the edge of the frame, but most interaction will take place on the touch screen. The three buttons act as a home/back command (located on the left), and volume/selection buttons on the right. It keeps things simple and functional, the buttons are especially useful if you're working out in gloves and can't get the touchscreen to register. On the rear of the deviceyou'll find an optical heart rate monitor, used to measure both your resting heart rate and heart rate zones during exercise. The Fitbit Blaze is sweat, rain, and splash proof, but it's not fully submersible, so you're not going to be tracking your swim sessions with this device. This seems like a missed opportunity, a chance to win points over the Apple Watch. 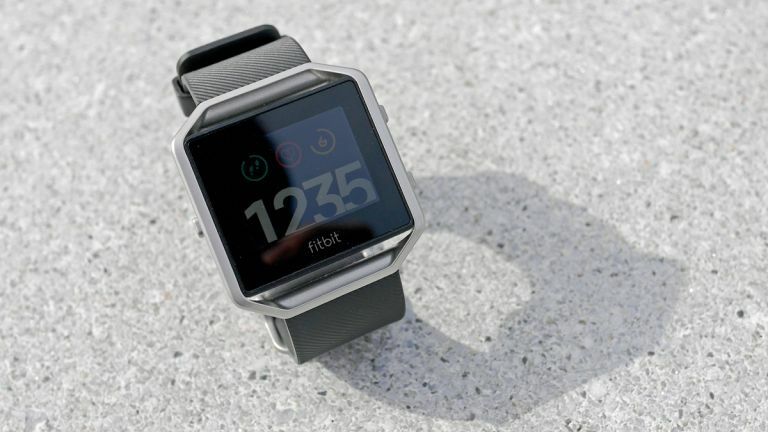 One killer feature the Fitbit does have is a five-day battery life, that bests all of its smartwatch rivals by a long shot, most of whom require daily charging. This is partly down to the small screen and low-powered OS, but it's great to see a wearable with proper battery life for once. The charging dock is yet another proprietary job from Fitbit, meaning you can't use the same charging cable from a Surge, Charge HR or Flex. Fitbit has a different charger for every product range they make, and that's starting to get annoying. The charging dock itself is fine, although it does require you to remove the screen unit from the frame (which is easy enough to do) and clamp it into the charging dock. This seems overly complicated compared to the wireless charging solutions found in other smartwatches. The colour screen gives Fitbit a chance to introduce a new UI, and as a first attempt, the company has done pretty well. Navigating the OS is slick and intuitive, with everything more or less laid out how you'd expect. Swipe up on the watch face to see your recent messages and notifications (although, that's only system notifications, including email, texts, calendars and calls - no Facebook or Whatsapp, which is disappointing). Swipe down on the watch face to see music controls and a silent mode toggle. Swiping from the right brings up a menu which includes today's stats, exercises, FitStar, a timer, alarms, and settings. While all of those are pretty self-explanatory, FitStar is the key here. Essentially, it's an app which guides you through workouts, first using the screen to demonstrate the exercise, then timing you while you do it. This is a big advantage over Fitbit's other models. At the time of writing there are four watch faces available from Fitbit to customise the look of your wearable. It's a nice touch, and 'Pop' is our current favourite, but I'd hope to see this expanded in the future. So the Fitbit Blaze operating system is basic, but it's functional and simple, that's a thumbs up in our book. As long as you're not expecting advanced interactive notifications and apps similar to those on the Apple Watch, you won't be disappointed. Like every other fitness tracker out there, the Fitbit Blaze is primarily a device for counting steps, and it does this pretty well. It also counts flights of stairs, and estimates the number of calories you've burned. Accuracy on the latter two is questionable, and although we haven't scientifically tested the Blaze, I thinkit's fair to say Fitbit's algorithm tends to overestimate these figures. It does, however, overestimate these consistently, so if it says you burned more calories today than you did yesterday, you can trust that conclusion. You should, therefore, use the Blaze as a motivation device rather than a precise measuring tool. The touch screen allows you to select other exercises, such as running, cycling, weight training, treadmill running, elliptical, and a general 'workout'. For example, when you begin a cycling workout it'll start to time you, measure how far you traveled, your average and max kph, average and max heart rate, estimated calories burned, and elevation change. Your stats are displayed post work out on the screen, making the device much more useful than a simple step counter. As previously mentioned, the device features a heart rate sensor, used to give you a rough idea of your resting heart rate. This seemed accurate to me, matching with various other fitness trackers I've tried. Then it comes to tracking active heart rate, there are a few issues with this. The main problem is that the screen turns off while you're exercising, so you have to wake the screen before you can see the data. Which is slightly annoying. Bluetooth syncing is fast, connecting first time on every attempt. Once you've synced your fitness data Fitbit's ecosystem really comes into its own. The company has had a lot of time to hone its app and that shows. There's a solid user base, and the app offers detailed information clearly, which is no mean feat. It also offers integration with the likes of Endomondo, MapMyRun and MyFitnessPal, with its wealth of user-sourced food calorie counts - essential if you're a dieter. The app is a pleasure to use, making keeping track of your activity easier. Because, you know, any excuse to fall off the wagon and we'll take it. The Blaze may not be a revolutionary device, but it fills a gap in Fitbit's line-up. It should appeal to those after a cheap smartwatch with good battery life. It's an attractive and functional wearable, and the screen adds a lot to the Fitbit experience. Our only issues with the Blaze is that it doesn't feel as premium as it's rivals, there's no waterproofing, and that large bezel makes it look dated. One final dilemma, does this go in our best fitness tracker list or best smartwatch list? T3 Tells It: Blaze of Glory - is Team T3 impressed by the Fitbit Blaze?